I'm confused. I was reading over Jay Smooth's breakdown of the Nas concert at Central Park (how bummed am I that I don't live in NYC?) and while it sounded awesome, Nas apparently said, on both the radio, and at the show, that Bush, "at least," was "gangsta" and it doens't sound like he meant it as a critique per se (this is, after all, someone who just dropped a song called "Thief's Theme"). 5) The FARC - terrorizing peasants in a village near you! Al Capone = Feds nailed him on tax evasion and he died of VD, in prison. Scarface = killed his best friend, couldn't save his sister and died, shot up like Bonnie and Clyde. Bonnie and Clyde = see above. I'm not making a claim as to whether or not gangstas should be celebrated or not, but at the very least, they should be people who face some level of adversity. With Bush, you can't fight the power when you are the power. After all, he has managed to run America into the shithole of international esteem by being President and screwing over 99.9% of the population (and countless overseas) using the powers vested in him by his office. When your alcoholic dad kicks the crap out of you and your mother, that's not supposed to be gangsta. When your boss sexually harasses you, that's not gangsta. When police put 41 shots through an unarmed man, that's not gangsta. When an army rapes and pillages its way through the countryside, that's not gangsta. My point: people in Bush's position are supposed to have the kind of power they do and even if he got into the office through dubious means, what he's done with that power hasn't exceeded much of what his position entails. I'm sure Clinton could have invaded random countries willy nilly when he wasn't getting his willie nillied in the broom closet. I'm just saying: don't big up Bush for pimping America when that's already part of the job description. 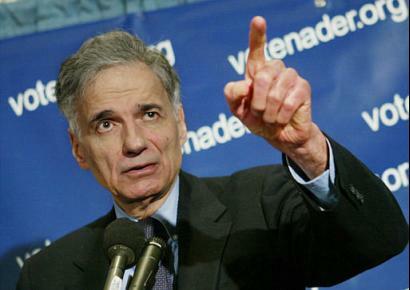 Now, who really is gangsta has to be Ralph Nader - look at the evidence? He's got no hope of surviving, many people despise and fear him, but he's powerful enough to salt everyone else's game (well, everyone else = Al Gore and the Democrats in 2000). You know what else is gangsta? This. SF/J asks, "has any other rapper taken as long (11 years) as Fat Joe to have a #1 hit?" Pop Life was going to volunteer Jay-Z with his seven years between "Hawaiian Sophie" and "Ain't No N****" but that's still four years shy of Fat Joe. Lean back! Devon Aoki = the next Paris + Xtina? What is Shyne smoking upstate? This story is just too good to be true, right? "Bear drinks 36 beers, passes out at campground".